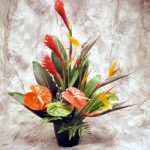 Exotic tropical flower arrangements ready for display right out of the box. A perfect gift for any occasion! Fresh tropical flowers and greenery delivered direct to your door from our Hawaii farm. 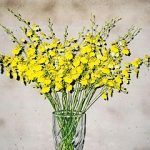 Need help arranging your flowers? Need some help arranging your flower assortment? 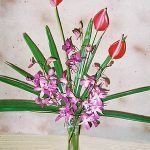 Check out our videos on how to assemble tropical flower arrangements. Yellow oncidium orchids dance among orange and red heliconia with red costus and anthuriums. 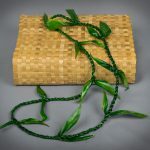 Ti leaf leis are just one of the many uses of the Ti plant. View cart “Valentine Bouquet” has been added to your cart. 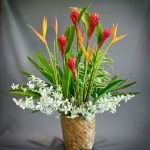 Shop our selection of Hawaiian Tropical Flowers ranging from anthuriums, orchids and exotic flowers, to carefully selected mixed flower gift boxes and Hawaiian leis. 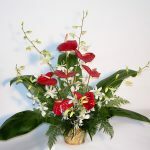 Our spectacular Orchids, Anthuriums and other exotic Hawaiian Tropical Flowers are all hand selected from our farm to give you or your loved one a memorable touch of Hawaii. We are located in Puna - the heartbeat of the Big Island of Hawaii where exotic and vibrant tropical flowers enrich the lives of our Ohana (Family) from the mountain to the sea.